According to their culture, wearing brass neck – rings symbolizes a beautiful form of body adornment. Girls start with their first nine rings as early as five years of age and new sets are substituted every four years on nine separate occasions. The last change occurs when a women is 45 years old. The weight and number of rings depends much on each wearer’s individual choice; the longest recorded is 32 brass rings weighing 13 – 15 kilos (around 32lbs !!). 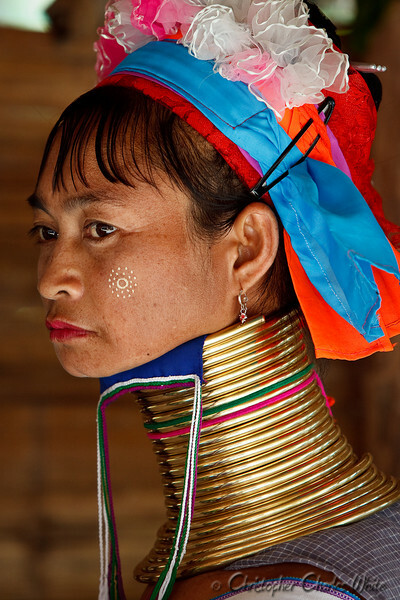 The truth about the Karen-Pa-Dong women is that they do not even have elongated necks! The heavy brass coils which they fit around their necks press down on the rib cage and cause the ribs to grow downwards. Furthermore, the weight of the coils pushes the necks and shoulder muscles deep into the shoulders. This creates the illusion of a longer neck, when in fact it is the upper body which has been shaped into the appearance of a longer neck.